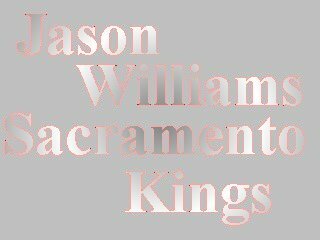 PHILADELPHIA -- Kings point guard Jason Williams must have figured he'd already said too much. So when presented an opportunity both before and after Friday night's 100-79 victory over the Philadelphia 76ers to respond to allegations that he'd made anti-Asian and anti-gay remarks to a couple of fans at a Feb. 28 game at Golden State, Williams made himself unavailable for comment. That was not the case for Kings vice president Geoff Petrie and owner Joe Maloof, who said similar behavior from Williams in the future will not be tolerated. But rookie forward Jabari Smith, who sat by Williams on the Kings' bench at the Arena in Oakland, read a written account from the Bay Area describing the incident and said he had many points of contention. "That's not true," Smith said after reading a story. "Those guys are out to get Jason." Smith wasn't alone in questioning the authenticity of the account provided to Bay Area newspapers. Cian Sanchez is a fan who says he sat behind the Golden State season-ticket holder who made the accusations in letters to the Kings and the NBA. Sanchez said he never heard any of those comments. Sanchez made those comments first in what he said was an unsolicited phone call to Joe Maloof. "I was in the general vicinity," Sanchez said, "and I know they were talking back and forth, Jason and this guy Michael Ching. I saw them arguing, but I never heard any of those anti-Asian remarks Jason was supposed to have made. I'm not saying he didn't say any of those things, but my girlfriend was with me, and she's Asian. So if he said some of those things, I think my ears would have been in tune to hear them." Petrie, the Kings' vice president of basketball operations, said Friday that the NBA handled the Williams situation sufficiently in this instance by fining him $15,000. Williams was fined $10,000 for similar behavior during a Nov. 29 game in San Antonio. "I've said before that Jason has to become a better caretaker of himself of his own soul off the court," Petrie said. "He has been counseled by us in an ongoing manner. We do not condone this type of behavior by either a player or any employee. "If situations such as these continue to happen, there definitely will be a point where something more substantial could happen in terms of penalties with missed games." Maloof said he wanted to talk to Williams in person before deciding how to attack the problem. Maloof offered to bring Ching to Sacramento for a game. Ching said that was not enough and wants an apology from Williams. Williams said Friday morning that he would apologize, but only after he received one first from Ching. Smith said Friday night that Ching owed Williams an apology. "The first thing he said to J-Will was, 'What drug are going to use next?'" Smith recounted. "Now how can you say something like that to a person and not expect to hear something back? And he called J-Will a 'skinhead.' Another dude called him a racist, and it just blew up from there. I didn't hear J-Will say anything racist to these guys."